How would you like to get a rebate check every year for select items your store sells? It’s possible now with our alliance with several vendors and manufacturers, who have offered volume-sales rebates to us, which we pass directly to you. Glidewell will track all the sales of these products and manage all the records throughout the year. All you do is say, “Yes, I want to be involved with this program,” and you’ll get a catalog of participating items and be on your way to a nice rebate later in the year. Your Glidewell sales rep is able to help you with a lot more than just tagging and re-tagging. We have access to amazing convenience store sales statistics that, when employed in your store, will cause product to move faster. How much would your operation benefit from proven, time-tested data from national, regional, Glidewell’s own, and individual store sources that put together an exact science of product-placement? Our reps will pass this knowledge on to you so you can start racking up more sales. Held annually in Fort Smith, we put together a trade show with our top vendors so you can come out and see the latest, greatest and hottest products Glidewell can deliver to you. These vendors understand buying power, and they are happy to give you, our customers, extra-special deals and incentives. The trade show also includes games, contests, prizes and a lot of fun and profitable ideas that you can start implementing in your store. Renowned for pristine white sand beaches and tempting turquoise waters, the exciting enclave of Playa del Carmen welcomes its most luxurious property yet…the all new, prestigious Paradisus Resort. Situated in a private bay on a stunning stretch of Caribbean coastline, this magnificent resort is loaded with chic décor and sophisticated amenities. 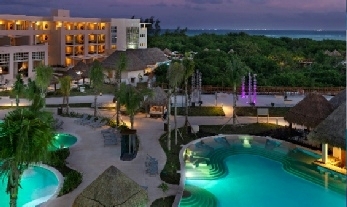 The Paradisus boasts a stellar location where guests can enjoy local attractions. The fabulous Fifth Avenue shops of Playa del Carmen are world-famous for their brilliant works of art…bargain of paintings, pottery, jewelry, and wood carving. A short ferry ride across the crystal-blue Caribbean takes you to the island of Cozumel – a great day trip for a change of pace. Adventure seekers can thrill in exciting activities and abundant “fun in the sun” sports such as snorkeling amid the world’s second largest coral reef. The ultimate five – star, all-inclusive experience awaits your arrival! See your sales representative for more information.